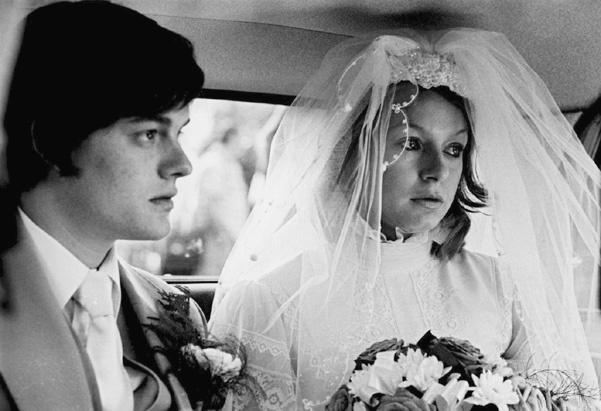 Ian and Debbie married young. Time to think about Control again, now I’m showing it to students. If you haven’t seen it, this is the film based on the book Touching From a Distance: Ian Curtis and Joy Division by Deborah Curtis (1995). For some background here is an interview with Deborah Curtis by Wigan’s finest, Laura Barton. The film vied with This Is England as the best British film of 2007 in my view. (It won four awards at the British Independent Film Awards and several other awards at major festivals.) It tells the remarkable story of Ian Curtis from the time when he met Debbie in 1973 up to his death by suicide in 1980, at the point when Joy Division, for whom he was lyricist and vocalist, were about to tour the US. I saw the film last November and was knocked out by the performances and the stagings organised by director Anton Corbijn and his team. My first reaction on watching the DVD was to realise how little there is in the film about the band and their music in the terms of the traditional music biopic – and how much more there is of the melodrama about Ian, Debbie and Annik (the Belgian woman he met on tour). So, this is the first task, perhaps – to get a handle on the film’s genre. Although it’s tempting to opt for the biopic, I think this is the secondary repertoire, even though it probably provides the most interest for some audiences. I wonder what the gender splits will be in dealing with the film? For the film to work purely as a biopic it ought to start earlier in Ian’s life and to include rather more of his family background and formative experiences. To work as a music biopic, it could miss some of the early family stuff, but it would need to focus on the musical development of Curtis and the other three members of Joy Division. Instead, the narrative works on two levels. First it is a melodrama – with a focus on the relationships between Ian and Debbie, Ian and Annik and between Ian and his own demons. Then there are elements of the musical – the kind of musical focusing mainly on public performances. These don’t work in biopic terms since there is no sense of musical progression. In a typical music biopic (certainly the main Hollywood biopics about popular music stars) there is usually a scene where the performer rebels against a manager or a record producer because they won’t allow the development of a new style of music etc. There is relatively little of this in Control. Nor is there much attempt to show the growing popularity of the band – where most biopics would make sure we knew dates and places, there is no real sense of a career being constructed according to some kind of plan. What there is, is the musical narrative (as in Ken Russell’s films about composers) about the tortured artist. In a long and thought-provoking article in film international no. 31, John Orr suggests that the aesthetic of the film is actually split between the “exterior (the life) [which] is high contrast often with a vertical look: the interior part (the music) has a more impressionistic feel and a more horizontal look, using the full width of the screen”. To some extent, Orr is referring to the musical v the melodrama, although it is a bit more complicated than that. On the melodrama question, Orr makes a number of interesting observations. He cites Corbijn as the son of a Lutheran pastor and summons up Bergman as another “Protestant son of the cloth” before moving on to suggest parallels with a famous British melodrama – Powell and Pressburger’s The Red Shoes (1948), the story of a ballet dancer who literally dies for her art. But then he suggests that perhaps the best comparison might be with a film itself influenced by the Red Shoes, Martin Scorsese’s Raging Bull (1980). However, what most interests me are Orr’s comments about the connections that have been made between Control and the 1960s British New Wave films, some of them shot not too far away from Macclesfield (Ian Curtis’s home throughout his life) in Stockport (A Kind of Loving, 1962) and Salford (A Taste of Honey, 1961). My own feeling when I first watched Control was that it looked very different from the representations of Northern England in the 1960s films. Now I’m not so sure, but still a little sceptical. It was quite brave of Corbijn to shoot in black and white CinemaScope – with a novice cinematographer (the German photographer Martin Ruhe) and a first time leading man – but as Corbijn points out, it is these three elements in the film that have garnered most praise. Corbijn chose black and white because that is how he thinks of Joy Division. When he came to England in 1979, he thought the North looked grey, he took black and white photos for the NME (New Musical Express) and the media images of the Manchester music scene were generally monochrome. He didn’t choose the aesthetic to make a connection to what has sometimes been called ‘Northern Realism’, a blanket term to describe both the New Wave films, Coronation Street and Northern television series and some more recent films such as Brassed Off (1996) and The Full Monty (1997). Corbijn admits he has no film background and no real knowledge of British Cinema of the 1960s. Instead, he brings a European photographer’s eye to bear on Northern English life. I think Orr’s analysis is very helpful in explaining how I feel watching the film. I don’t think he had the benefit of the DVD when he wrote the piece, because what he claims are Macclesfield exteriors and Manchester interiors were in several cases filmed around Nottingham (as the involvement of the East Midlands Screen Agency suggests). But otherwise, I think he explains the effect of Corbijn’s approach. I felt the images were clean, sharp, still, distanced and ‘European’. Much of the 1960s New Wave is full of talk and sociological and cultural background. However, those 1960s films were often made by Southern middle class directors working on novels by working class Norther writers, so there are moments of ‘outsider’ observation as well. Perhaps I’ll use a clip from the only CinemaScope B+W print I can think of from the New Wave for comparison (Billy Liar 1963) – which though a comedy-fantasy, does share the thematic of the young man for whom writing might be a way out of his home environment. There is a lot more to discuss about the film, but now I’m eager to hear what students have to say after the screenings.